First of all, it's probably necessary to take a step back and rewind to roughly T minus four months ago, when I completely swore off vitamins. Yes, that's right—as a previous devotee to almost every kind of supplement (from fish oil to vitamin D to a hefty dose of probiotics), I went completely cold turkey on my regimen, and quite surprisingly, my skin was the better for it. At the time, I thought it was a miracle and reveled at the idea that all my skin woes (think angry red breakouts and a spattering of whiteheads on my chin and forehead) could be solved by simply not taking the vitamins that A) were supposed to help my skin and B) I didn't like taking to begin with. Bliss. Alas, you can imagine my dismay when those pesky breakouts started to reappear and my aforementioned whiteheads reprised their role as the starring act to my struggling skin show. Adding fuel to the fire, I noticed I wasn't feeling all that great. Even though I was doing my best to exercise, get at least six to seven hours of sleep, and maintain a healthy diet, I was consistently fatigued, anxious, and just feeling distant from my usual bright-eyed, bushy-tailed self. So, once again, I went back to the supplement-themed drawing board. But this time, I had something special up my sleeve: a new, super-buzzy, super-cool, super-customizable supplement company called Care/of. Keep reading for everything you need to know about the brand (and take it from me—you'll never feel more jazzed about the idea of vitamins). 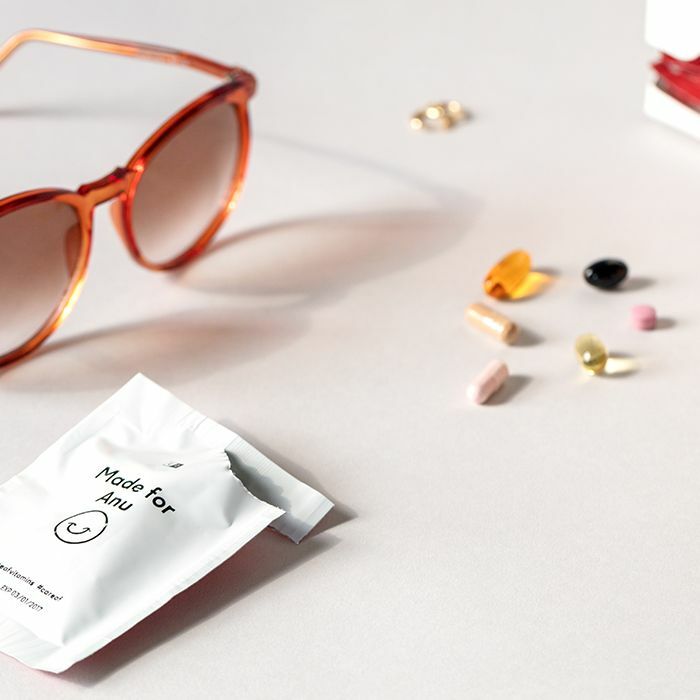 "We all have our own health goals, so the idea that there is one multivitamin that works for all of us is just outdated," Care/of co-founder and CEO Craig Elbert explains. "We built Care/of with a focus on personalization—you get what you need to feel great without overdoing it on other supplements. It's like having a one-on-one with a nutritionist without having to leave your home." After having seen Care/of reviewed (and raved about) by a few of my favorite wellness bloggers, I was intrigued. As someone totally on board with the idea that vitamins are hardly one-size-fits-all, the concept of a personalized regimen specifically catering to my needs and concerns was remarkably appealing—especially considering my new slew of symptoms like fatigue and some anxiety. Thus, I headed to the website and began to answer some questions, and as Elbert explains, there's some methodology involved. "When people visit our site, we ask a set of questions about their diet, lifestyle, and health concerns. That information is then put through an algorithm we built that incorporates peer-reviewed research, a wide base of traditional medicine, and input from our scientific advisory board," he says. Then after asking some questions (it takes five minutes maybe), Care/of provides the vitamin and supplement recommendations individually tailored to you, along with ingredient lists, dosages, and unbiased research. As Elbert says, this makes it super easy to see how strong the research is for that particular supplement and review it yourself. What I especially loved about the experience was that I wasn't immediately locked into a specific grouping of vitamins that I may or may not have wanted to take. I was able to use Care/of prescription as a guideline, take a look at their research (and outside studies, as well) and decide on the supplements I thought would best serve my current needs. Ultimately, I ended up pairing my pack down to Rhodiola, Ashwagandha, and magnesium and adding zinc (for immunity), which hadn't been an initial recommendation but was something a hormone expert suggested to me based on a few of my other symptoms. Again, that's part of the beauty of the brand: You're not tied down and can take its recommendations with a grain of salt. And to be honest, I was initially surprised by how many recommendations it provided me with. Which begs the question: Is there such a thing as taking too many vitamins? And are all of the Care/of vitamins safe to combine? "There isn't a maximum number of vitamins you should take, but it's good to be thoughtful about what supplements you actually need. It's not unsafe to combine supplements, but some absorb better if they're taken at different times," explains Elbert. For example, he tells me that with certain minerals, it's more strategic to take them throughout the day (versus all at once) to maximize benefits and absorption. And, of course, it's absolutely pivotal to check with your doctor before taking any vitamins or supplements to ensure they won't interfere with other medications or health concerns. After you've customized and composed your supplement pack to your liking, the rest is easy and, to be honest, pretty novel: "We're changing the typical vitamin shopping experience with our website, but even beyond that, we're changing the typical vitamin taking experience," Elbert tells me. "Every month, you get 30 daily vitamin packs. They're easy to grab and go and are printed with inspiring quotes and fun facts (and your name). They come in a limited-edition dispenser with a cool design, so you can leave it out in your kitchen or bedside table to help remind you to take them. It's really a different experience." "We make sure to take great care to ensure our line of vitamins and minerals is made from the best ingredients out there. We source our ingredients for the places they grow best, so each nutrient is as effective, safe, and bioavailable as it can be. Clean production practices are also key for us. We avoid the use of harsh solvents or processing materials. Instead, we use procedures that help retain the integrity of the nutrients in our vitamins and supplements," Elberts explains. Though I can't say I've noticed any earth-shattering changes in my mood or energy levels, (vitamins aren't a cure-all, after all), I do notice a difference on the days when I forget to take the vitamins, and overall, I've felt an ease in anxiety (a definite win in my book). Add in my much happier wallet and an increased incentive to actually take my vitamins, and you could say I've become 100% devoted to my Care/of routine. Next up: My skin did the unthinkable when I stopped taking my supplements.